Roghayeh Azizi Mirmahaleh, a 60-year-old Iranian living in Montreal who was set to be deported to Iran next week, has been granted a two-year temporary residency permit. Roghayeh Azizi Mirmahaleh, who was set to be deported to Iran next week, has been granted a two-year temporary residency permit and can stay in Canada, her lawyer has confirmed. The 60-year-old who lives in Montreal spent three years in an Iranian prison for political activism. Her husband was executed in Iran before she moved to Canada five years ago. Federal Immigration Minister Ahmed Hussen granted the woman a special temporary residency permit Thursday morning, and she was released from custody hours later. Azizi Mirmahaleh and her daughter, Sahar Bahrami, emerged from the downtown Montreal Immigration, Refugees and Citizenship Canada office with their arms linked. "She said she's so happy that she's with me [and] that she wishes every political prisoner in Iran would be free," Bahrami said, translating from Farsi for her mother. "We went through a really difficult time, but we're happy that finally, finally..." she said, her voice trailing off. Bahrami said the plan for today is to celebrate, but that her mother will continue to advocate for a free Iran. Azizi Mirmahaleh will also be able to attend Bahrami's wedding next month. Bahrami had said she feared her mother could face torture or even death if she was returned to Iran. Azizi Mirmahaleh's application for refugee status was refused in 2013. Her lawyer Stéphanie Valois said she believes the rejection was due to her affiliation with Mujahedin-e Khalq (MEK), an exiled opposition group that backs the overthrow of the Islamic Republic of Iran. 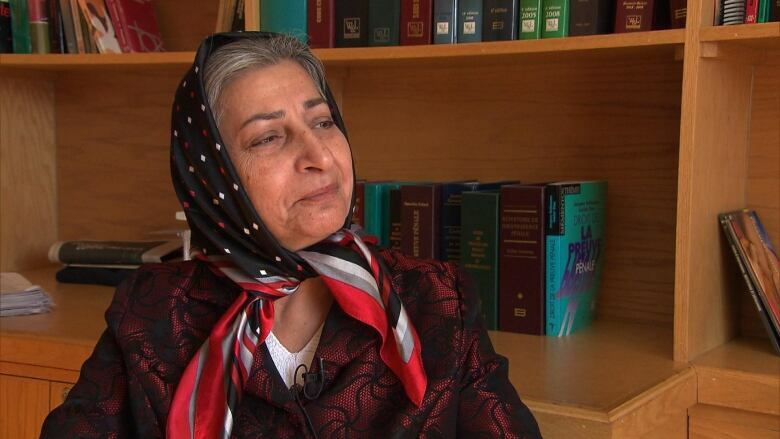 Azizi Mirmahaleh and her husband had distributed pamphlets in Iran printed by the group. Last month, a Canadian immigration officer decided it would be safe to send her back to Iran. Valois said that they will still be contesting that decision. She had been detained at the immigration detention centre in Laval since Tuesday and was scheduled to return to Iran Feb. 28. Quebec Immigration Minister Kathleen Weil was one of a number of politicians, including Montreal Mayor Denis Coderre and federal Transportation Minister Marc Garneau, who spoke in favour of allowing Azizi Mirmahaleh to stay in Canada. She said while interventions at the provincial level carry a certain amount of weight, the decision was the result of group effort by politicians at all levels. While she deferred specifics about what lies ahead for Azizi Mirmahaleh to her federal counterpart, Weil said she knows it will be a complex process. "I think [Hussen has] found a good solution for now, for two years, and I think it's to better be able to find a solution that would be permanent," she said. Opposition Québec Solidaire MNA Amir Khadir said this is a good opportunity for the federal government to consider a moratorium on deporting political dissenters to countries with harsh attitudes toward dissent, such as Iran and Saudi Arabia. "It's evident [Azizi Mirmahaleh] needs to be given permanent protection, to be allowed to stay here as a permanent resident," he said.